Pressing Aids Round-up - Peek-a-Boo Pages - Patterns, Fabric & More! I know I have written a couple of posts fairly recently about the importance of pressing, but it really is one of the simplest ways to give your sewing projects a professional finish. Because of that, people throughout the years have invented pressing aids to make the process simpler and more precise. I have rounded up 9 pressing aids for you today. A few of them are essentials in my sewing room, while some were new to me. Try some of these out! If you aren’t interested in making your own from the tutorials I shared, there are ready-made versions of nearly all of these that you can purchase. 1. 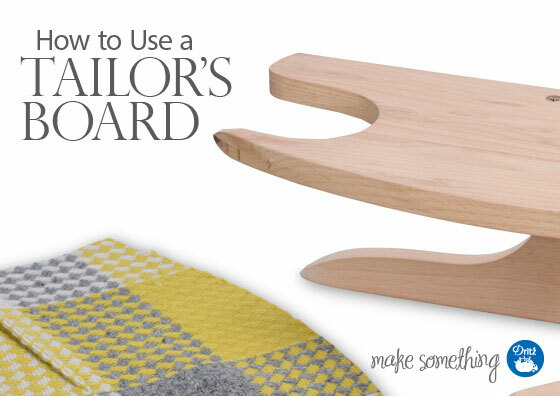 How to Use a Tailor’s Board from Dritz.com. All of the weird shapes and angles on this tool allow you to press all of the awkward nooks and crannies of your projects. 2. DIY Sleeve Board from The Curious Kiwi. This small ironing board slides inside sleeves and trouser legs. 3. DIY Tailor’s Ham & Sausage from Serger Pepper. I use my tailor’s ham all the time. It allows you to press curved seams (like sleeves or princess seams) and to press full areas (like gathers or darts) without crushing the fabric. 4. The Ultimate Pressing Aid from The Bearded Craftsman. This is more of a pressing tip than a tool. This post claims that vinegar is the key to removing creases from fabric. I can’t wait to try it out! 5. The Hot Hemmer on Lazy Girl Designs. 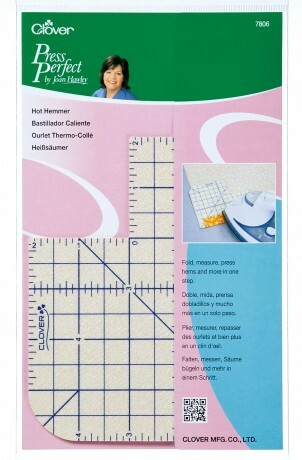 This tool allows you to accurately measure and press seams at the same time. 6. The Iron Finger, also on Lazy Girl Designs. This tool looks like it could come in handy for lots of things, including holding fabric so that your fingers stay a safe distance away from the iron. 7. 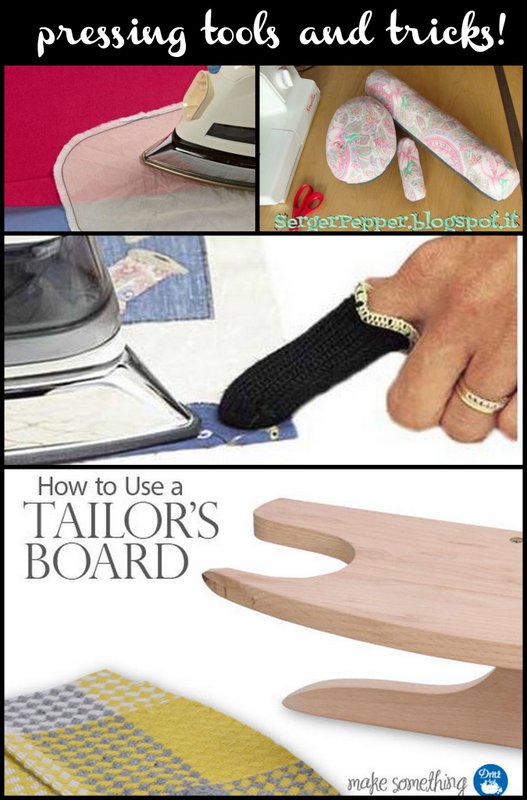 DIY Ironing Mit from Serger Pepper. This actually allows you to iron right on top of your hand. 8. Cool Fingers from Annie’s Craft Store. This one protects your finger so you can hold things in place right next to the iron without burning yourself. Yep, I could have used this a few times. 9. Guide to Press Cloths from Threads Magazine. A press cloth is a layer that you place between the iron and your fabric. It protects the fabric from scorch marks and iron shine while allowing you to use more heat and steam. This article explains the fabrics that work best for press cloths in different situations.